For as good as the Los Angeles Rams offense has been this season, one unit continues to get somewhat overlooked because of the talent they have at skill positions. The offensive line might be the best in the NFL, doing an outstanding job protecting Jared Goff and opening up running lanes for Todd Gurley. But just how good as the line been? Pro Football Focus’ grading system puts it into perspective. PFF shared the top-graded guards and tackles in the league thus far and the Rams are well-represented. 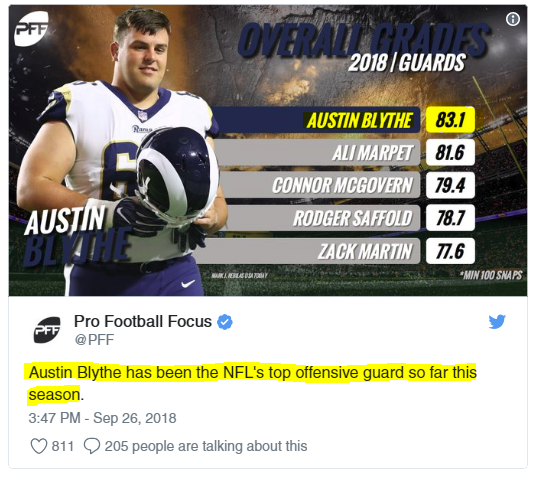 Austin Blythe, who replaced Jamon Brown during his two-game suspension, has been the best guard in the NFL through three weeks and is in no danger of losing his job. Rodgers Saffold, not surprisingly, is close behind as the fourth-highest graded guard. On the outside, the tackles have been almost as good. Andrew Whitworth ranks No. 1 among tackles with an overall grade of 82.5, topping David Bakhtiari by one point. At No. 5 on the list is Rob Havenstein (79.8), who’s performed admirably after signing an extension this offseason. Needless to say, Goff is in good hands with those four protecting him, while John Sullivan has been decent at center, ranking 18th among players at his position.